While workers were angry and willing to fight, too often their anger was aimed at fellow workers of a different colour rather than at the employers and authorities responsible for their exploitation and poverty. Sometimes this occurred in the absence of socialist political leadership, but on occasion, labour movement misleadership played a poisonous role. On 23 January, four days before the Glasgow general strike, trade union leader Emmanuel Shinwell told a 600-strong seafarers’ union meeting that the unemployment they faced was caused by Chinese sailors joining British ships. White sailors, fired up by his speech, went out and attacked black workers, starting what became known as the ‘Harbour Riot’. On 15 April, white men objecting to white women consorting with Arab men started serious fighting in Cable Street, east London. The next month, the East End was hit with four days of rioting, as mobs of 4-5,000 white men attacked lodging houses with black seamen inside. In June, ‘race riots’ took place in Liverpool, Newport and Cardiff, usually started by white men attacking black men, often involving weapons, sometimes resulting in killings. The two most common pretexts for whites attacking black were objections to black men socialising with white women, and the allegation that immigrants were undermining British workers’ jobs and wages. While the former is now universally condemned as both sexist and racist, the latter is still widely held, sadly including by sections of the labour movement and the left. Just as it was a century ago, this attitude is both false and divisive. 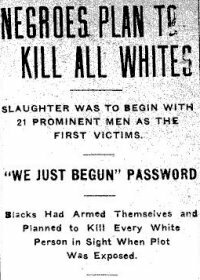 In the USA, months of racist violence in 1919 became known as ‘Red Summer’, named after the blood spilled. The most serious was the week-long Chicago race riot, deliberately provoked by employers sending blacked-up whites to burn white stockyard workers’ houses. By 3 August, twenty-three blacks and fifteen whites were dead. While at least some in the labour movement tried to unite black and white workers, the employers and authorities were keen to sow division. Earlier in July in Chicago, Stockyards Labor council called a parade to celebrate a victory against the meat-packing bosses, but the police banned the united black-white parade and insisted that black and white workers parade separately. Some newspapers were also willing to use racism to divide workers and attack socialists. At the end of October, the Philadelphia Public Ledger published the ‘Red Bible’, a version of the antisemitic forgery the Protocols of the Elders of Zion, with ‘Jews’ replaced by ‘Bolsheviks’. To read more about working-class struggle in 1919, buy this pamphlet.